China's government has traditionally used its control of the largely state-owned banking sector to regulate the country's pace of economic growth, directing it to pump out cheap credit in good times and restricting the volume of new loans to prevent overheating. But controlling credit has become more difficult as the financial system gets more sophisticated, analysts say, complicating Beijing's efforts to bring the economy in for a smooth landing in coming months. China has a long history of gray-market financing flowing from small, informal and unregulated groups, to sectors not well covered by banks. A number of formally incorporated entities, including trust, leasing and guarantee companies, have also emerged, with the scope to provide alternative financing. As banks labor under stricter limitations on how they can lend, they have been looking to trust companies in particular to trim their balance sheets and lessen their regulatory burden. 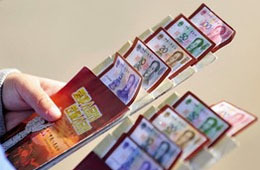 In a report Thursday, Fitch Ratings estimated that China's banks already have blown past the 7.5 trillion yuan ($1.126 trillion) limit that regulators set on new local currency lending for this year and extended more than three trillion yuan in credit that hasn't been recorded on their balance sheets.